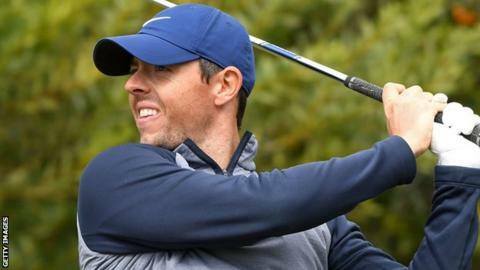 Rory McIlroy secured a third successive top-five finish at a PGA Tour event as JB Holmes won the Genesis Open. McIlroy, 29, started his final round with an eagle and moved just two shots off the lead after chipping in from a bunker on the 16th. But a par and bogey left him fourth, as Holmes closed out the California event. The American, 36, overturned a four-shot deficit in the final 18 holes as Justin Thomas paid for a four-over par round to miss out by a single shot. Like McIlroy, 14-time major winner Tiger Woods also chipped in from a greenside bunker on the 16th hole during a one-over-par round which saw him finish tied for 15th on six-under overall. Were Holmes slow play accusations justified? It was Holmes' first win on Tour since 2015 and owed much to him dealing with the blustery conditions and disruptions from bad weather at the Riviera Country Club course. Both Holmes and compatriot Thomas played 33 holes on the final day as a result of suspensions to play earlier in the week, with just 30 minutes separating the end of their third round with the start of their final 18 holes. And Holmes - who finished on 14-under-par thanks to a one-under final round - found key putts, notably on the 13th when he drained a 12-foot par putt, while Thomas needed four putts to close out a double-bogey. "Two three-putts and a four-putt on my back nine," Thomas said after signing for a four-over 75. "The third putt on 13, I could feel the wind coming and I got scared so I tried to hit it harder - and I did hit it harder and that's why I missed it." Holmes, who made seven pars on his final seven holes, described his win as "huge" but faced criticism from commentators and on social media for slow play. "You play in 25-mile-an-hour gusty winds and see how fast you play," he said afterwards. "You can't just get up there and whack it when it's blowing that hard." McIlroy's two-under-par final round of 69 saw him finish tied for fourth with Australia's Marc Leishman on 11 under. An eagle on his opening hole provided early momentum but three dropped shots on the back nine proved costly. The Northern Irishman finished in a tie for fifth at both the Farmers Insurance Open on his last PGA Tour start and the Sentry Tournament of Champions in early January.